Some of the largest, most complex projects ever devised are either under development or have been completed in the Middle East. Although projects can and have been delivered with world class results on many levels, the majority are less successful. In fact, cost and schedule predictability is getting worse. Meanwhile, the average competitiveness of projects in the Middle East is stagnant and continues to lag the global industry. The strong trend shown in Figure 1 for execution schedule slip is especially surprising considering the heavy emphasis many regional companies—particularly those that are nationally owned—have historically placed on predictability in general and schedule predictability, in particular. Why is this happening and what needs to change to fix the problem? Like much of the world from 2005 to 2008, the project market in the Middle East was hot. The escalating demand for equipment, materials, and experienced professionals to support the unprecedented wave of capital project work in the region stretched supply chains as never before. The regional market cooled down following the global financial crisis of 2008 but recovered quickly and has remained warm until very recently. The regional data show that the overall cost and schedule competitiveness over this period actually has remained fairly stable with no significant change to the average, albeit conservative, performance. However, if we look at predictability metrics by referencing the authorized targets, the story is very different. 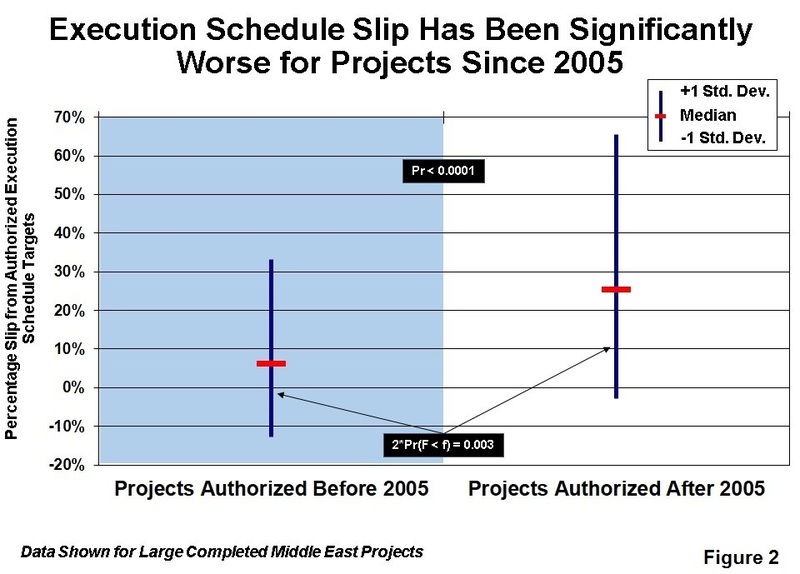 By comparing the schedule predictability of large Middle East projects authorized since 2005 with that of the earlier projects in the region, we find that average schedule slip has increased from 6 percent to over 25 percent. The variability around these averages has also increased significantly (Figure 2). Counterintuitively, the average execution schedule targets became appreciably shorter during the hot market when resources were stretched thinly; slip due to late contractor mobilization was especially common. The contractors increasingly struggled to find adequately experienced staff for new projects with the situation compounded by previous projects overrunning and tying up resources much longer than expected. Few owner companies made appropriate allowances in their own target setting to account for market realities like this during the era. 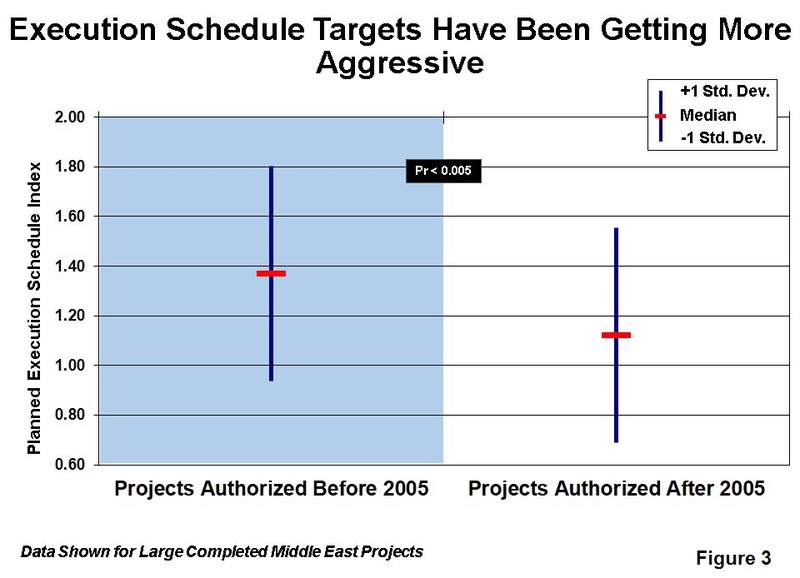 Figure 3 shows how execution schedule targets for Middle East region projects authorized after 2005 were actually 18 percent more aggressive than those of earlier projects. Competitive target setting is a Best Practice but is only effective in promoting better results when those executing the projects acknowledge that the targets are reasonable and, more importantly, achievable. During the boom, this vital link was lost and has not been reestablished. A key driver behind the trend of setting ever more aggressive schedule targets was the understandable desire to get projects into execution as quickly as possible to beat both the rapidly escalating project services market and capitalize on high commodity prices. Notably, projects groups spent less time planning and defining accelerated project schedules. As a result, the average Front-End Loading (FEL) index—a measure IPA uses to rate project definition prior to execution—in the region fell from an average Fair to Poor rating. Owner companies have been unsuccessful at improving project definition activities to this day. The targets promised at authorization are considerably undermined by the approximation in data that comes from incomplete definition. The situation is further complicated by the popular and widespread use of unqualified end dates on projects as a management tool to make teams go faster. Projects in the Middle East too frequently have end dates imposed on the project team by either business or government without suitable tradeoff qualification or recourse to challenge them once the project scope is frozen. This has had the tendency over many years to fuel poor scheduling habits and in particular the back-planning of activities from the imposed end dates. Although schedule targets have become much more aggressive, actual schedule competitiveness has stayed stubbornly poor. This disconnect underscores how broken many companies’ target setting processes have become. When correctly applied, however, competitive target setting should drive better performance by motivating teams to beat their targets. This has not been happening widely in the Middle East for a long time, with teams routinely not believing that the schedule targets they must meet are achievable. 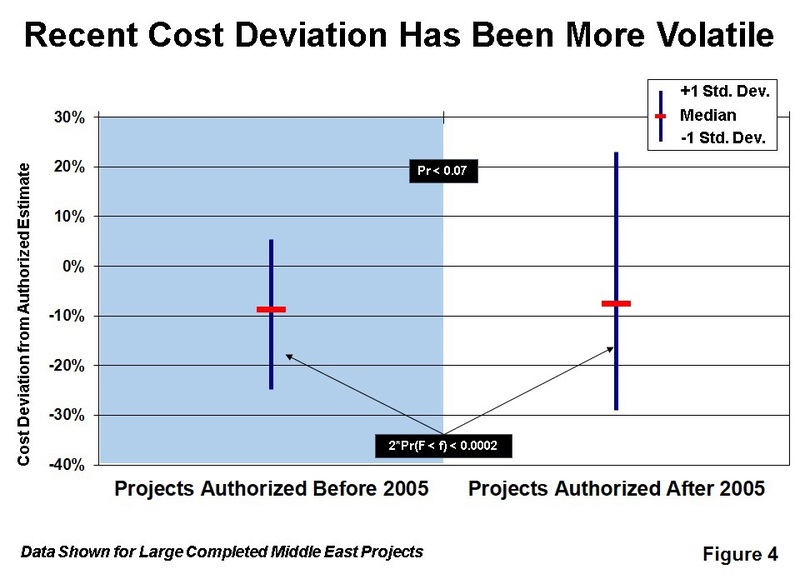 Most projects in the Middle East executed for regionally based companies are expected to underrun their estimates and the vast majority still do. It is an ingrained regional culture that is difficult to change. Historically, this has meant that most cost estimates for projects in the region have been conservative compared to Industry, and they still are. The effect of these poor cost target setting practices was exacerbated during and since the boom years and has resulted in much more unpredictable cost deviation at present, despite average cost underruns remaining at around 9 percent (Figure 4). It is interesting to note that the contingency allocation for projects has not changed appreciably over this time and is still set on most projects at or just below the magic 10 percent threshold. Target setting mechanisms need to be re-connected with the current project environment. They need to be useful again in promoting incremental improvements in project performance over the long term. For some companies, this will require a considerable cultural shift and even an organizational change. Primarily, project teams need to believe again that their targets are both competitive and realistically achievable. If teams are not actively aligned with and bought into their targets, they are unlikely to be motivated to stretch for them and long-term portfolio performance will suffer. An ongoing issue in this area is that many regional companies still do not have established target setting processes during FEL that include an open discussion between business and project teams on key areas. In addition, measurable targets are rarely set for anything beyond the basic cost and schedule metrics. As such, project-specific success criteria should include not only cost and schedule targets, but also workable metric targets for safety, operability, reliability, and/or other locally important factors like local content. At present, they rarely do. Emphasizing the importance of appropriate target setting by establishing a structured process is an important first step to setting more appropriate targets and to improving long-term competitiveness. Using an active target-setting process that is referenced clearly within historical performance ranges and to real market conditions represents a considerable advantage that few regional companies have yet to take up.